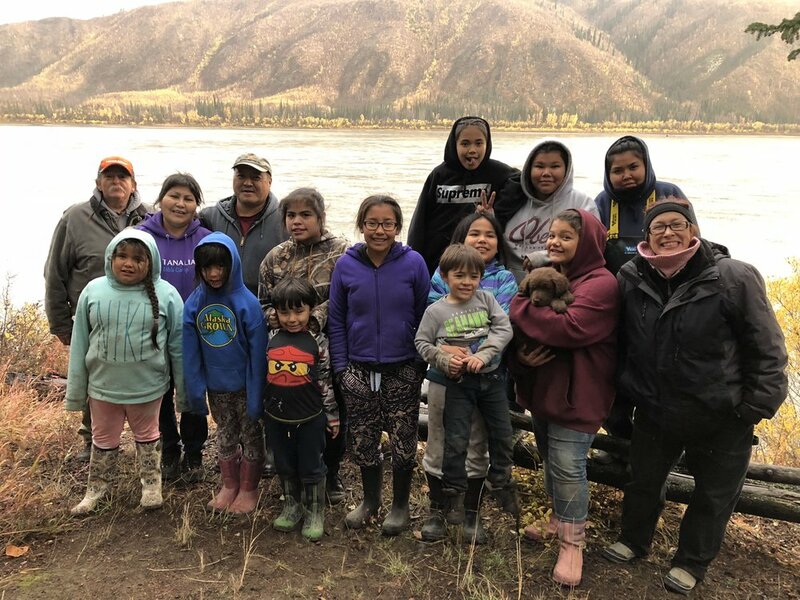 September 17-23, 2018, some students and adults from AGSD and YKSD came together to work, learn, and play along the shores of the Yukon River. Teachers from AGSD and YKSD enjoyed some quality collaboration, discussion, and activity time together at Twin Bears campground in August 2018. Topics ranged from A-CHILL lesson plans, learning about the Iditarod Sled Dog Race’s curriculum taking turns skijoring with dogs, and a variety of other locally and culturally relevant educational opportunities demonstrated by our fabulous presenters. Happy and inspired educators from AGSD & YKSD! Diane Johnson, Iditarod Trail race Education Director, and Alaskan teacher Kristi Therriault showcase the Iditarod Online Curriculum. 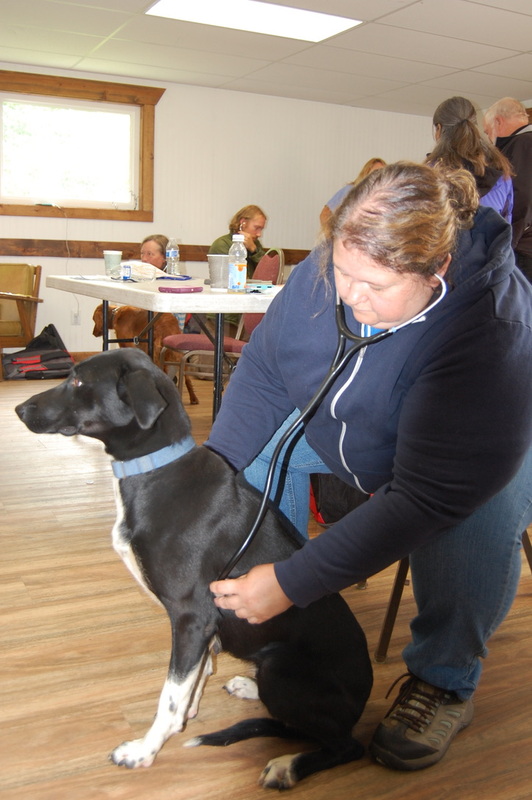 Veterinarian Hayden Nevill demonstrates how to check basic vitals on a dog. Campers practice taking vital stats on some of our guest dogs. Project Director LeAnn Young reviews the resources, information, and activity news and updates posted to the achill.life website. Roni Noonan Agre and Rob Fabian also walked through the A-CHILL lesson plans for participants. 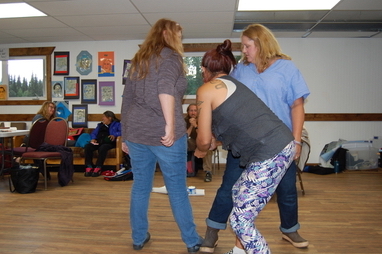 Participants have fun doing an evening activity led by artist Chris Greenfield-Pastro. Participants had fun sharing their artwork of each other! Caroline Brown from Alaska Fish & Game’s Subsistence Department, demonstrated the quantitative and qualitative data and other resources available for teachers, along with some sample projects and models co-developed with teachers in classrooms from other rural districts to add relevance/integration for student learning and projects. Leslie Shallcross from the Cooperative Extension led campers through skills and lesson plan ideas while preparing brined wild Alaskan Salmon for smoking. Soaking salmon strips in the brine. Placing the trays of brined salmon into the smoker. Checking the salmon in the smoker. Mari Hoe-Raitto prepares some of her dogs for skijoring activity. A camper enjoys skijoring with one of our guest dogs. Campers participating in creative writing activity led by Chris Greeenfield-Pastro. Teacher and Vet Science courses developer Peggy Bruno demonstrates and discusses course content and implementation. Amanda Attla leads campers in a sample NYO activity involving a greased stick. The winner pulls it out of their competitor’s grasp. Yatibaey Evans, Director of Native Education at North Star Borough SD, participates with our campers in a sample NYO activity involving a greased stick. The winner pulls it out of their competitor’s grasp. Campers get a taste of NYO through a sample game involving a greased stick. The winner pulls it out of their competitor’s grasp. Marcia Anderson from Store Outside Your Door share with campers different foods - and the preparation of them - that they can find in their regional backyard. Dr. Barbara Adams and Dr. Jerry Lipka from UAF led an activity highlighting their Math in a Cultural Context curriculums. Representatives from the project’s Advisory Council met one evening to talk about successes and to look forward into the coming school year’s activities. About 21 teachers and 10 community members from AGSD and YKSD communities attended this two-day workshop in Fairbanks in March. Participants talked about what's working well in collaboration between community members and school teachers for integrating academic learning with local and culturally responsive contexts, along with learning styles. Facilitator Malinda Chase (AINE) kicks off the two-day workshop. Kathy Turco talks about George Attla's Champion Mindset. Amanda Attla adding to the Champion Mindset discussion. 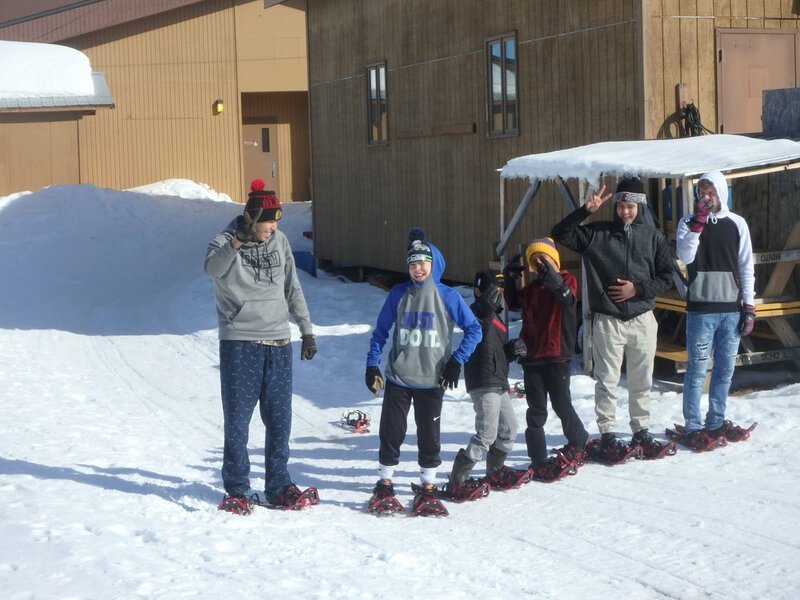 On March 8-29, Dot Lake hosted Mentasta students for two days of skiing on the lake and mushing activities. 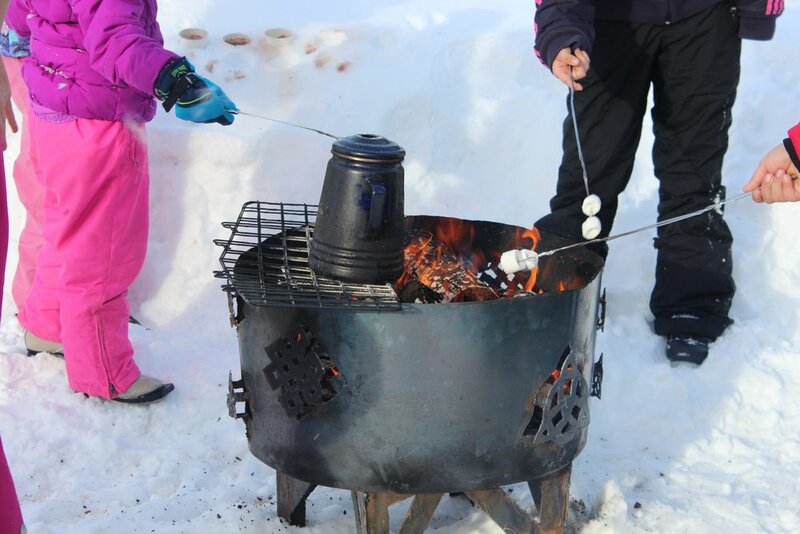 Students skied the numerous groomed trails on the lake and warmed up by student handcrafted fire pits. 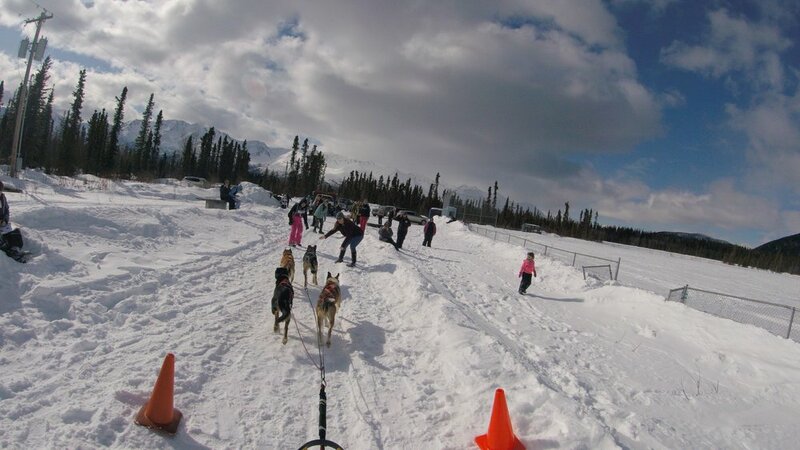 In the evening, students played a variety of mushing games and learned Iditarod history. 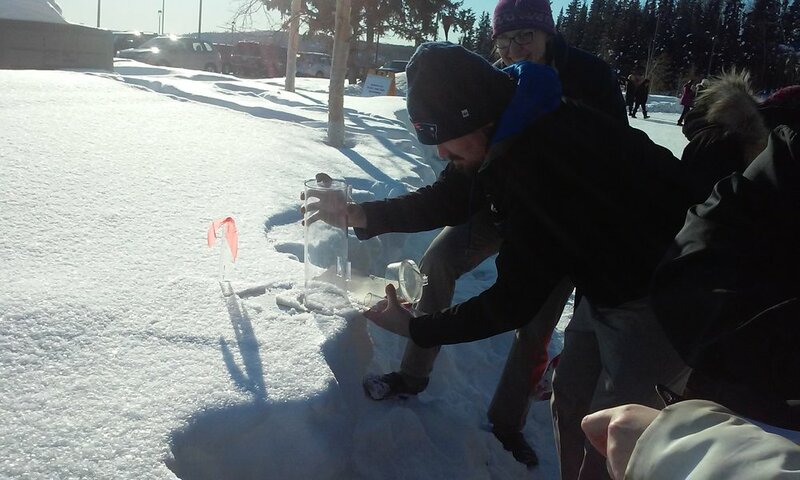 Dot Lake students shared their dog house design projects and tested out the sled they built with rides on the lake. 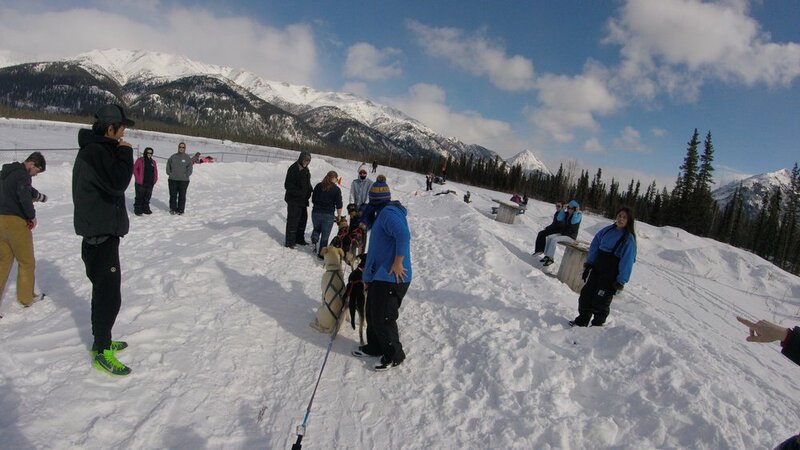 A Tanacross student dog handler joined us when Mr. Fabian brought out a few dogs for mushing and skijoring. Group on lake with dogs. Students with dog handler from Tanacross. Nulato students love sled dogs! 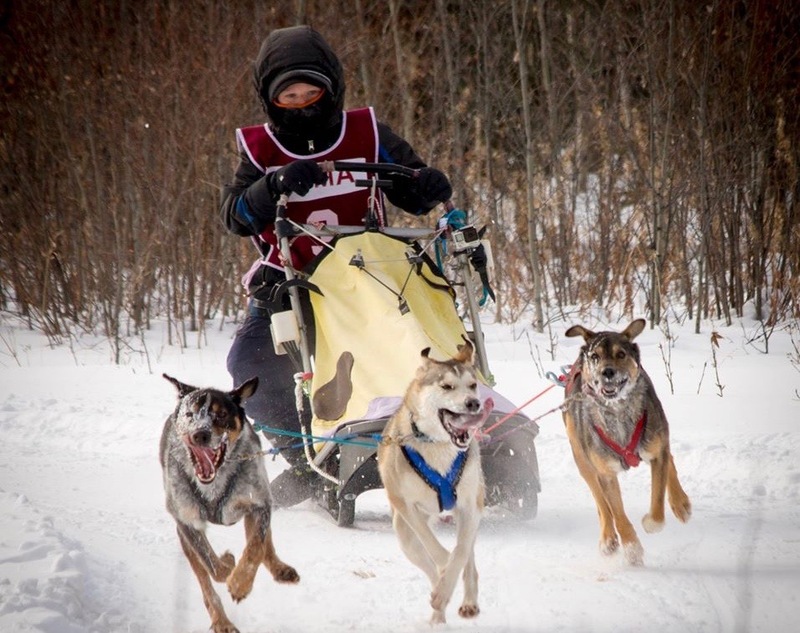 School teacher Amy Graham coordinates the day and time to bring students to an after-school In-kennel class taught by A-CHILL dog musher teacher, Charley Wofford. Both volunteer their time on any other day that students show up. His dog yard is small, however, there are enough dogs for students to learn about care. Dogs eat a cooked meal every day and are exercised many times a week. Students help with all chores and are also currently caring for a litter of winter puppies. Students gather for hands-on class at new dog yard. Students trying to make friends with a shy sled dog. 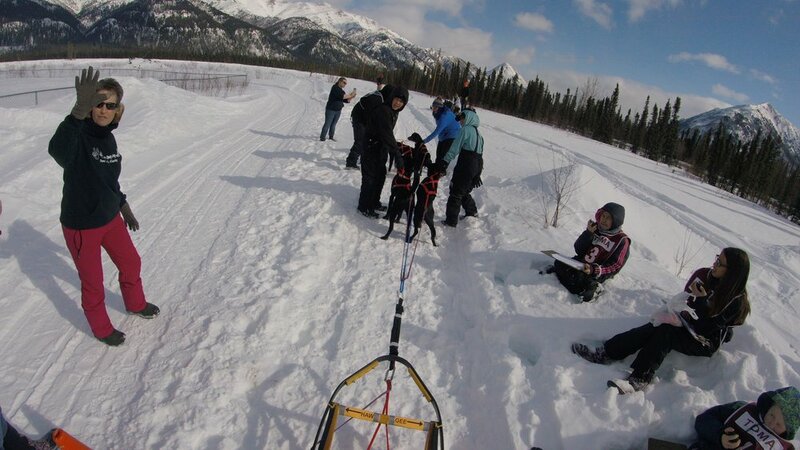 Dog musher teacher Charley Wofford, shows students how to harness a dog. Dog musher teacher Charley Wofford helps a student harness a dog. Students take turns scooping dog food. The students of Minto School wanted to learn how to build a sled so A-CHILL signed on long-distance dog musher and sled builder Cody Strathe of SQUID ACRES KENNEL to teach a class. With the help of school teacher Scott Brucker, they made a plan to build three toboggan-type sleds. Last spring, students learned about sled design; they cut and prepared to wood for parts and bent sled runners. This fall the students cut plastic and learned to assemble a sled. They finished the sleds in November just in time for snow! Then, on the last day of Fall Semester, the teacher, A-CHILL dog musher teacher and a handful of volunteers geared up to take middle and elementary school ice fishing. Students posing with the three sleds they built. Students posing with the kennel signs. Students posing with the kennel signs . Students work with plastic for sled . Dog Musher Teacher Lloyd Charlie holds sign that students made. Students drilling some of new runners. 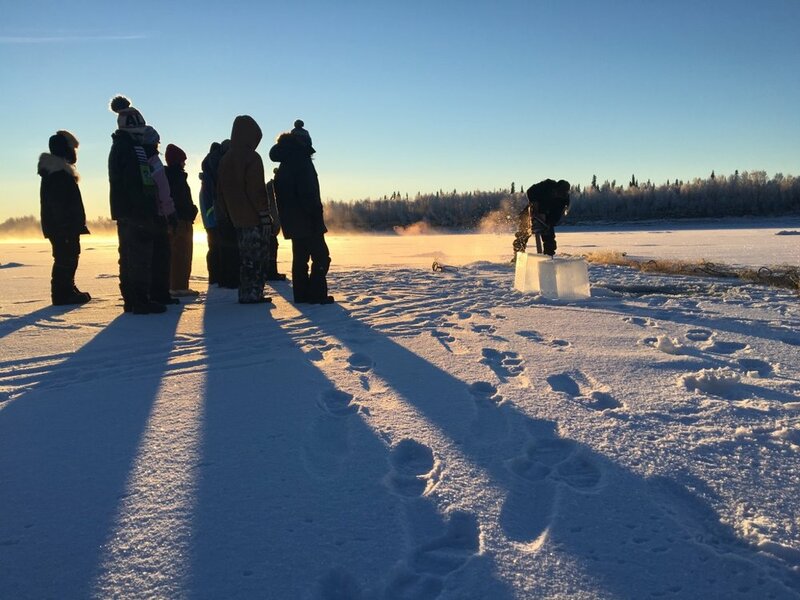 Students learned to use a hand auger to drill holes, the art of using a lure to catch fish under the ice and how to start, and keep a fire to be sure everyone kept warm. Northway School students wanted to learn how to fish for dogs and also run them with an ATV. 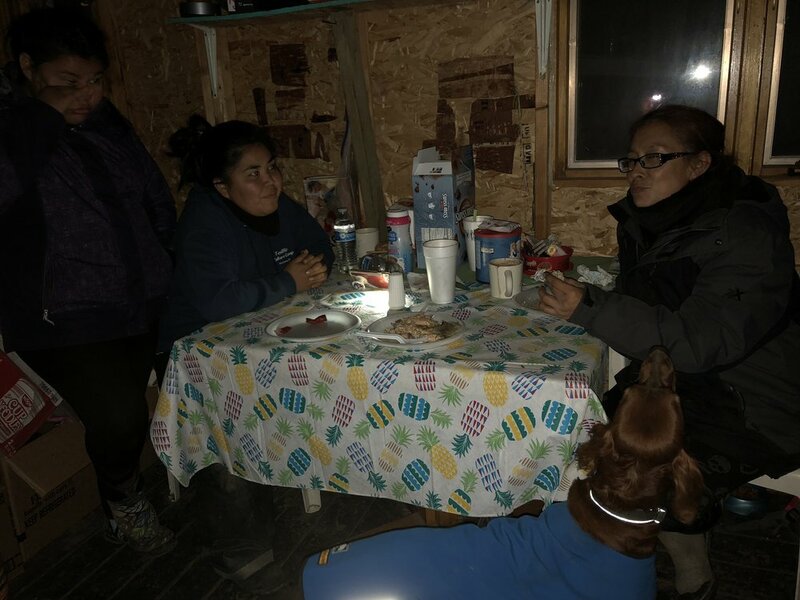 So, the middle school teacher and her students headed to Tanacross to work with two dog musher teachers and a Local Culture Expert. Students learned to how to work together to handle a fish net and gill net fish in the Tanana River. They learned boat safety and how to pick and identify salmon and whitefish, along with how to select fish for the dogs. On another trip, students learned to harness and hookup dogs to an ATV for early season training. Also in October, a Local Culture Expert taught students to work with a moose hide as part of a mitten-making project. 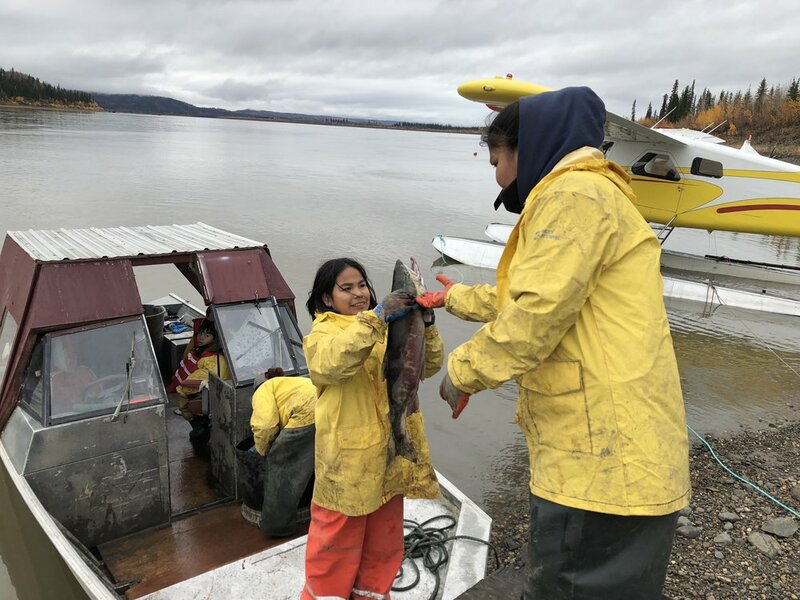 Students in boat catching salmon in Tanacross. Teacher Bryn Fadum with a fish from catch. Roni Noonan-Agre teaching students how to string out a net. Roni Noonan-Agre and students in dog yard. Rob Fabian with students running dogs by ATV. Dog Musher Teacher Hugh Bifelt with dogs and students in classroom. Students learning how to cut moose hide. 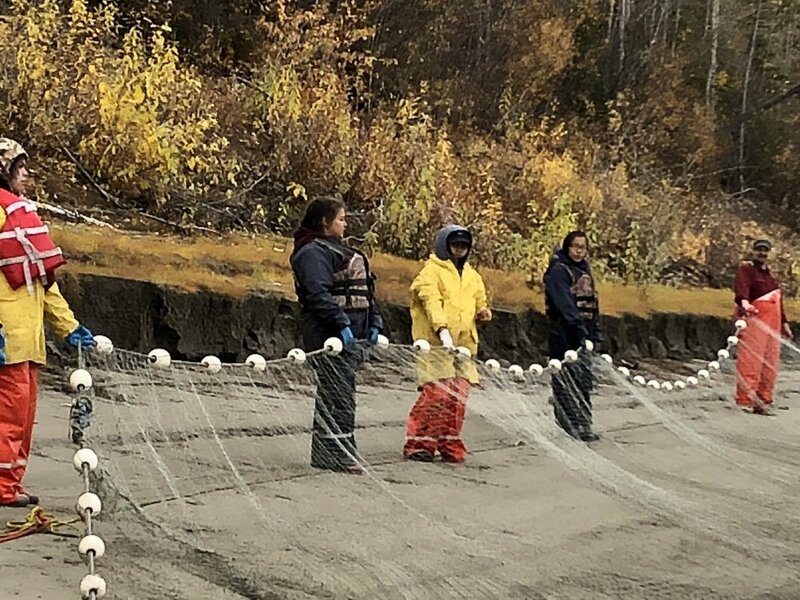 Students started a subsistence fishing class by emptying a 100-foot gill net in the Tanana River, which was set from shore. 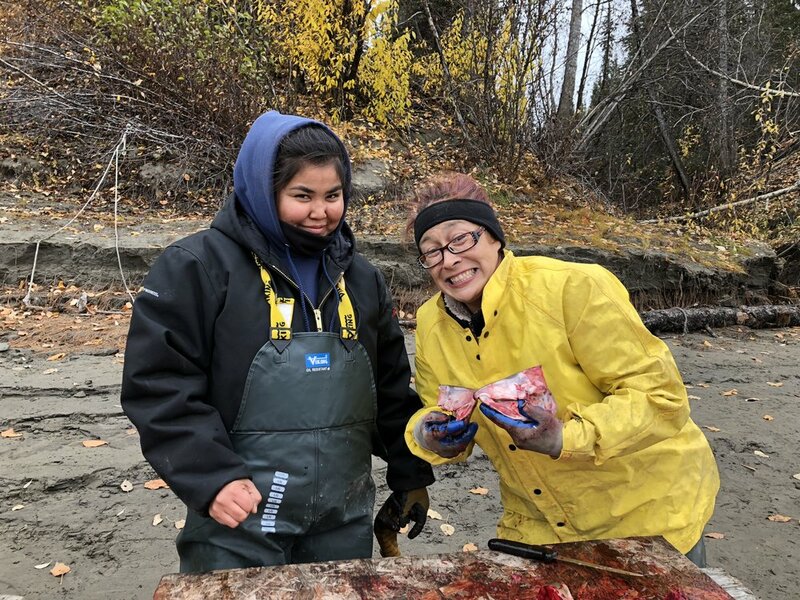 Students and principal-teacher, Denise Keys and teacher aide, Galen Isaac, separated fish into two buckets, as they pulled them from the net; 1) fish for dog food (chum salmon); and, 2) fish for human consumption (fresh fat white fish). As they worked the nets, Cultural Experts Davis Paul and Leonard Sanford explained why the fish were for people and/or dogs. Also, how all the parts of the white fish provided necessary foods for the villagers, i.e. frying white fish bellies and fat gland to make cooking oil. The class ended with students stretching out the gill net and cleaning it for future repair. Students going to check fish net. Student with caught fish in bucket. Students leaning in to check fish net. The Ruby community believes consistent year-round work and learning can positively affect youth and help them do better in school. Tanana Chiefs Conference and A-CHILL funded a Ruby Community-Youth & Sled Dog Summer Pilot Project designed by Youth Coordinator, Melvin Captain and the Tribe. Last spring, Melvin worked as the teacher aide who brought students to weekly A-CHILL classes at his father’s kennel. He observed that students working with dogs were happy and productive, so, with the volunteer help of his father, youth continued summer sled dog-related activities. Youth learned to gut and cut fish, hang fish in smokehouse, store fish, and take care of dogs. Ready to cook dry fish. 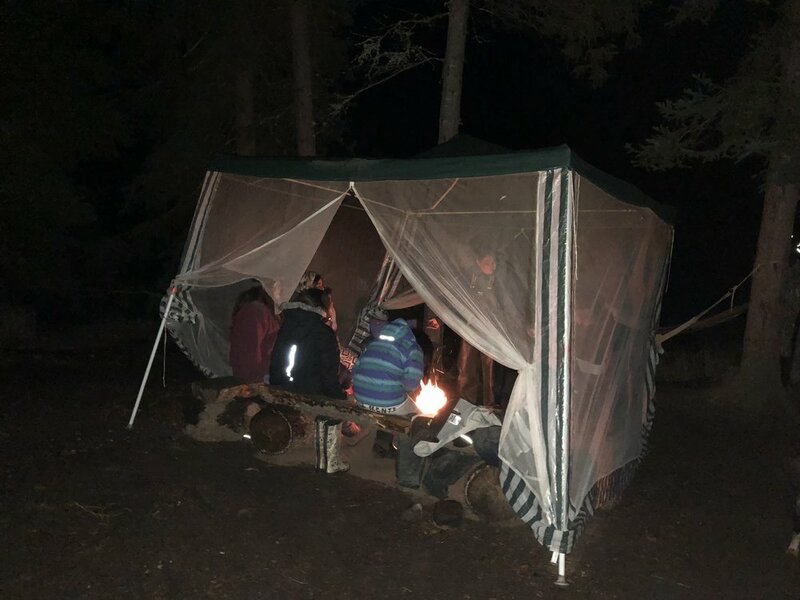 About five dozen participants - middle/high school students, teachers, dog mushers and local culture experts from regional communities - came together for an activity-packed week in late July. 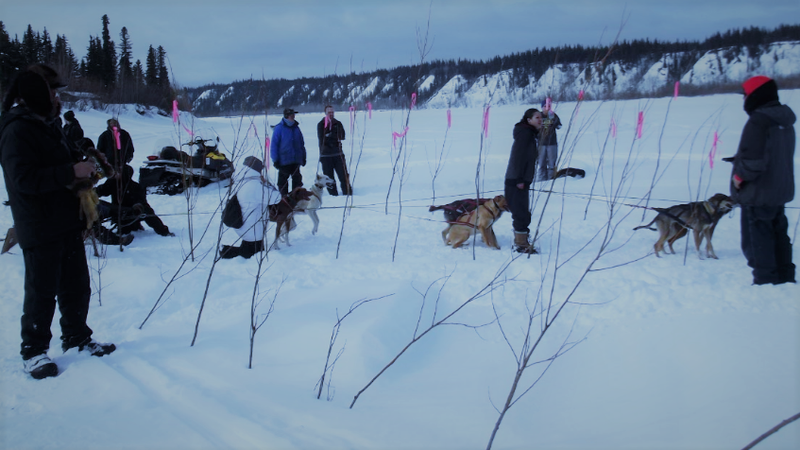 Based at the University of Alaska-Fairbanks (UAF) campus with some field trips sprinkled in, topics ranged from Veterinary Medicine and health careers, to dog and kennel care/management, dog mushing history, and hands-on cultural activities tied to academic learning in the classroom. Thanks to everyone who attended and to those who helped make it a fantastic experience for all - Elders, facilitators from UAF and the Association of Interior Native Educators (AINE), helping hands and hearts from a variety of community supporters, and AGSD, YKSD, and other A-CHILL project coordinators! Group photo at Howard Luke Camp. 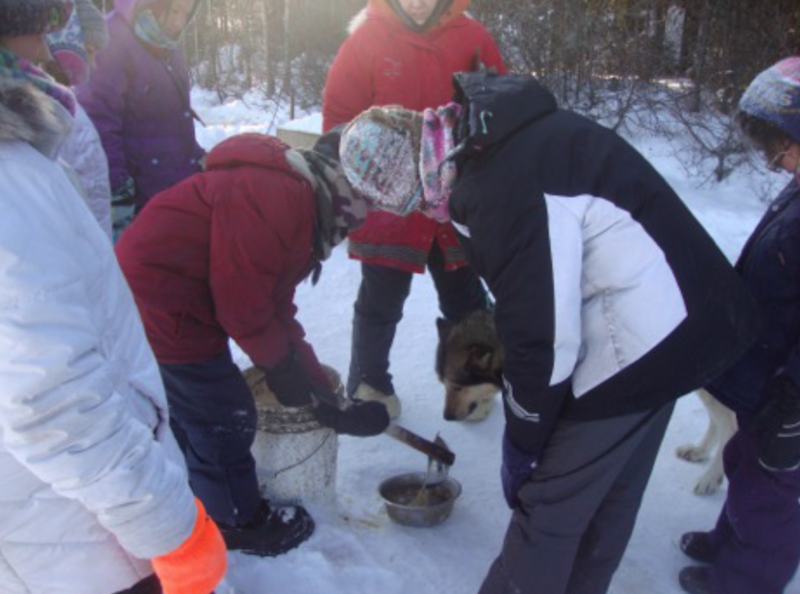 Dog musher teacher shows students how to make chains. 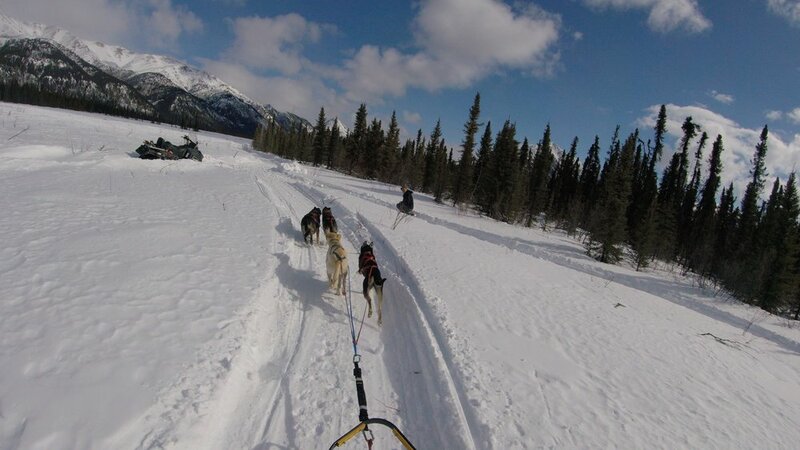 Dog musher teacher shows students how to make lines. 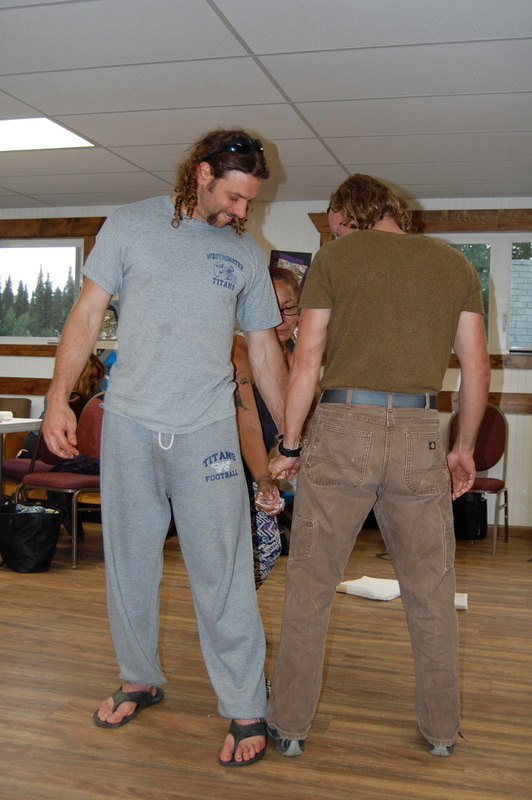 Dog musher teachers shows students and teachers how to tie knots. An Elder shows A-CHILL students, dog mushers, and teachers how to mend fish net. Dr. Arleigh Reynolds, UAF Dept of Vet Medicine, talks about training sled dogs. UAF Dept of Vet Medicine Professor, Dr. Vaughan Seed, teaches sled dog physiology. Students & Dog Musher Teachers listen to anatomy lecture. Students look at the displays at the Fairbanks Community Museum. Dog Musher Teachers check out dog sled during field trip to the Fairbanks Community Museum. Cultural Expert shares during A-CHILL talking circle at Howard Luke Camp. Some students & community members who helped build the fish wheel. Quest guest speaker teaches students to make lines. Minto School students learn to bead from Quest guest speaker. Minto School students learn to build a dog box. 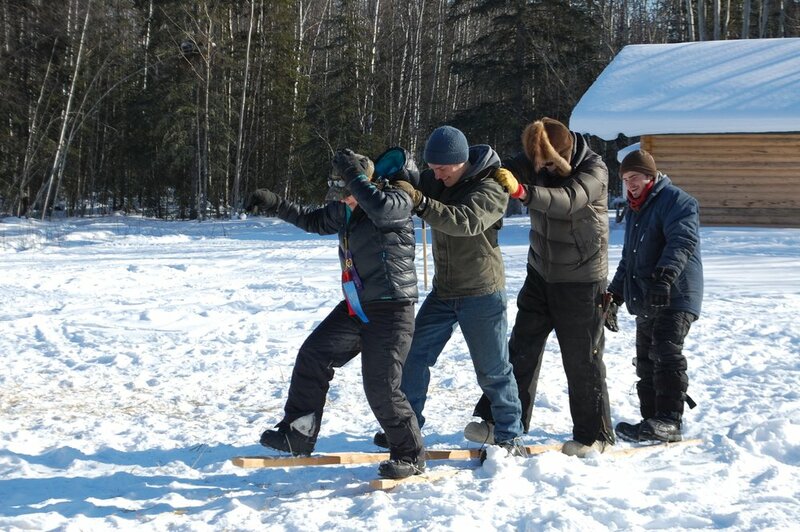 Minto School students learn how to make sled runners from Quest guest speakers. Minto School students finish building a dog box. Dog boxes finished by Minto School students. Minto School students finish burn letters into kennel sign. Minto Spring Carnival students work together to make kennel sign. Minto Spring Carnival students carry fire sticks. Minto Spring Carnival students learn to brew tea in snow pit. Minto School student learns how to bike with a dog. Huslia Jr. Carnival - Young musher getting ready. Huslia Jr. Carnival - Young musher near starting line. Huslia Jr. Carnival - One-dog racer on the move! Huslia Jr. Carnival - One-dog racer at Finish Line. Huslia Jr. Carnival - Youth snowshoe competition. Huslia Jr. Carnival - Tug-of-War competition. Huslia Jr. Carnival - Community Cake and cakes for 1st Place competition winners . Allakaket Spring Carnival - Dog racers getting ready at the Starting Line..
Eagle & Tanacross students listen to guest speaker. Huslia Jr. Carnival - one-dog racer with St. Bernard. Huslia Jr. Carnival - Junior Musher racing. Huslia Jr. Carnvial - Junior musher closing in on Finish Line. Allakaket Spring Carnival - Hooking up race dogs. 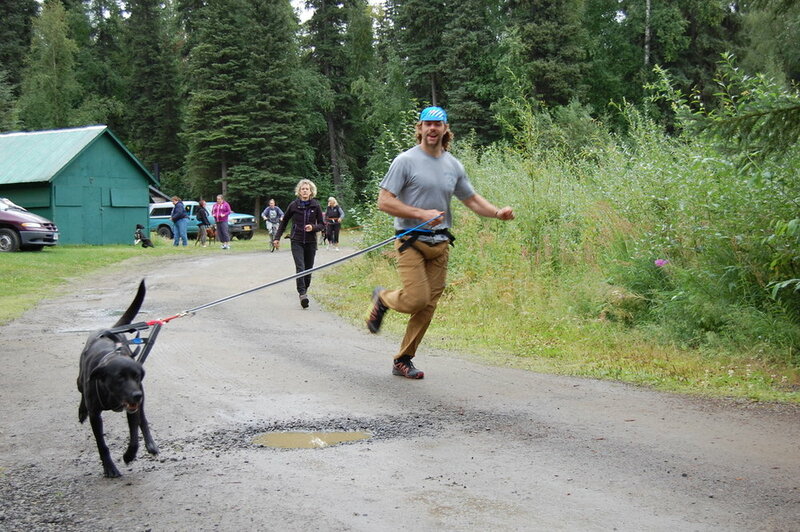 Allakaket Spring Carnival - Dog musher crossing Finish Line. Guest speaker at Tok School teaching students about dog handling. Tok students with dog in classroom. Tok student exercising with dog. Tok student exercising a dog. Guest speaker working with students and dogs at Tok School. Eagle & Tanacross students listen to Quest guest speaker in classroom. 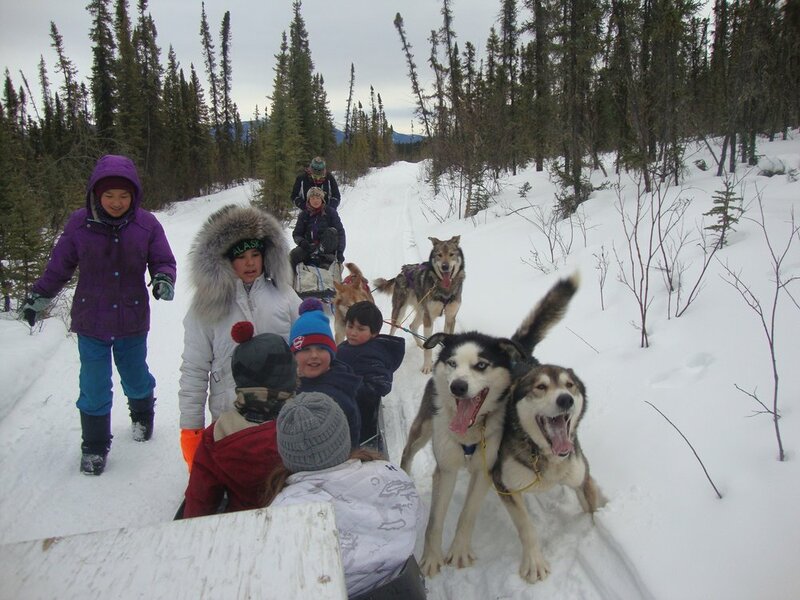 Eagle & Tanacross students in dog yard with Musher Teacher. Eagle & Tanacross students in dog yard. Tanacross student with dog in yard. Eagle & Tanacross students learn about the sled. Eagle & Tanacross students learn how to use a video camera. 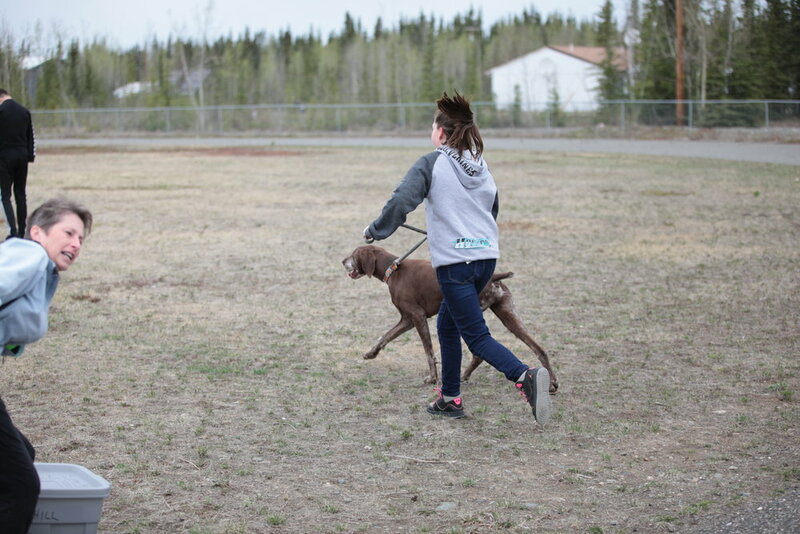 Eagle & Tanacross students learn to run with dogs. Eagle & Tanacross students run with dogs. The Eagle community along the Yukon River. Eagle Museum fish wheel display. Eagle Fish Wheel Project - Local Culture Expert making the basket portion. Eagle Fish Wheel Project - Youth working on the basket portion. Eagle Fish Wheel Project - Youth filming work on the floater base by Local Culture Experts. 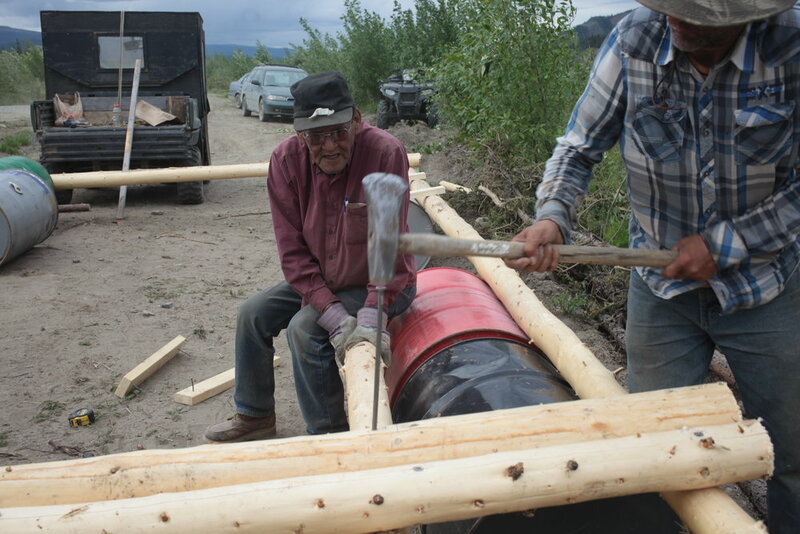 Eagle Fish Wheel Project - Youth and Local Culture Experts assemble floater base. Eagle Fish Wheel Project - Local Culture Experts hammer stake for floater base. 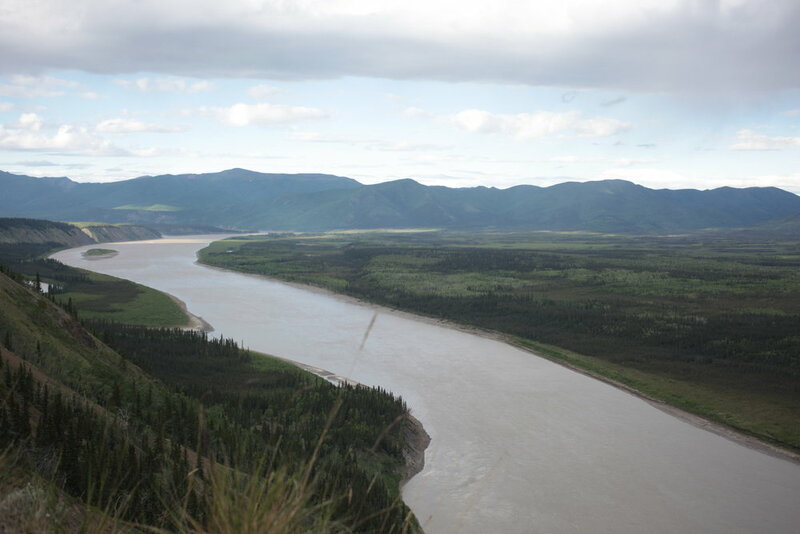 Approximate location of where Eagle's new fish wheel will be used on the Yukon River. Classes teaching students about dog mushing and animal care were busy last Spring! For example, Tanacross & Tok Schools welcomed visiting instructors, Amanda Attla, Jessie Holmes, and Joe Bifelt to teach during AGSD‘s annual Culture Week. 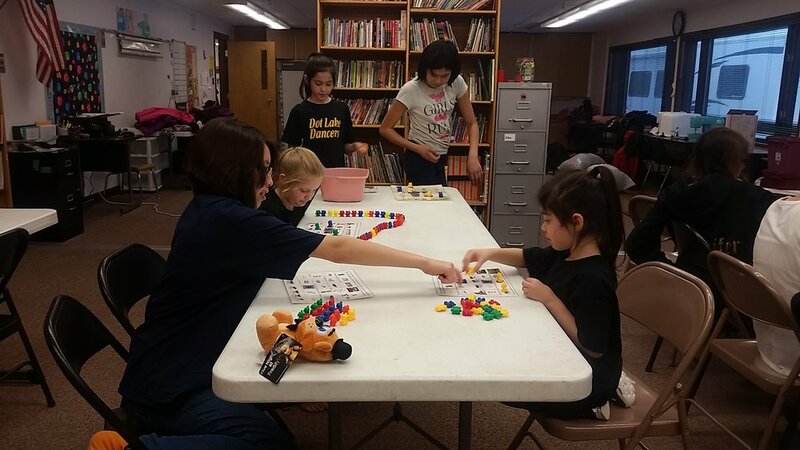 Amanda taught students to make bead necklaces, how to sew hide with and without fur, and told stories about growing up with her father, the late George Attla. Dog mushers Jessie Holmes and Joe Bifelt talked to students about sled dog care and about training them for distance and sprint races. They also taught students how to build a dog house from start to finish. 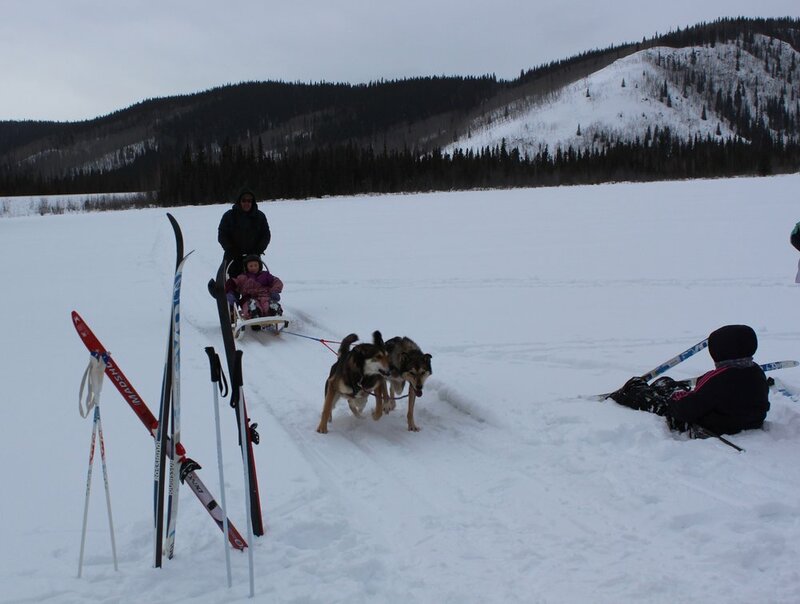 The Tanacross School class rests with Musher Teacher Leonard Sanford and his dogs. Tanacross students and Leonard Sanford stand by Iditarod map at Hugh Neff's Kennel. Tanacross students with Musher Hugh Neff and his Iditarod checkpoint bags. 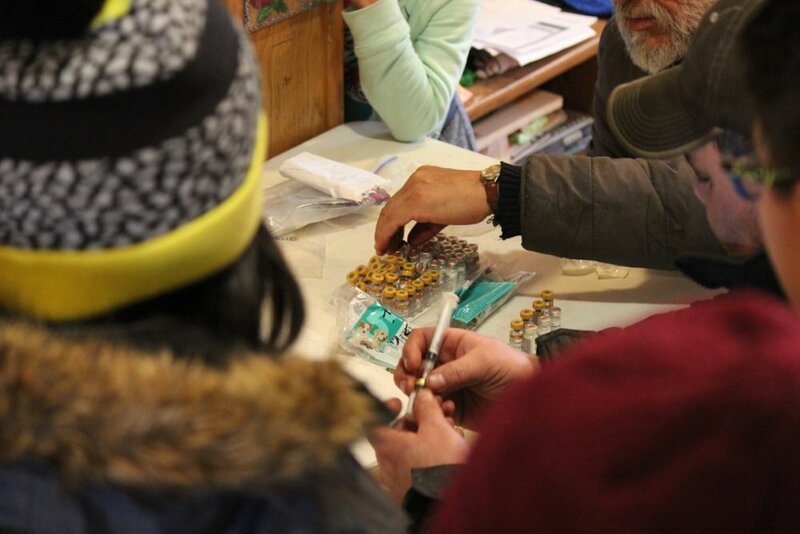 Tanacross students and Leonard Sanford learn more about the Iditarod checkpoint bags. Hugh Neff explains the Iditarod checkpoint bags at his kennel. Huslia Junior HS students listening to Musher Wilson Sam telling stories. Huslia JHS students observe how to cut holes in ice to set fish net. Huslian JHS students working and learning at Wilson Sam's kennel. 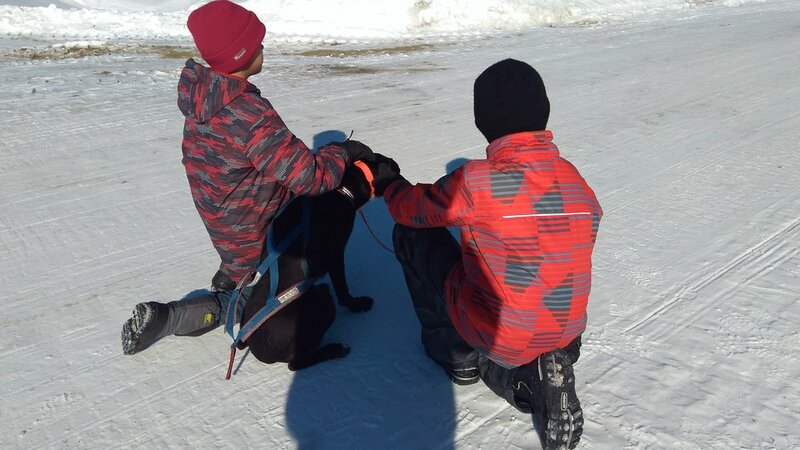 Huslia JHS students take Wilson Sam's dogs for walk on the lake. Huslia JHS students learn about vaccines from Wes Henry and Floyd Vent. Huslia JHS students learn about sled measurements from Wes Henry. Huslia JHS students learn how to vaccinate dogs at Floyd Vent's kennel. Huslia JHS students learn to set fish net in ice of the Koyukuk River. Huslia JHS student files a sled stanchion in Wes Henry's class. 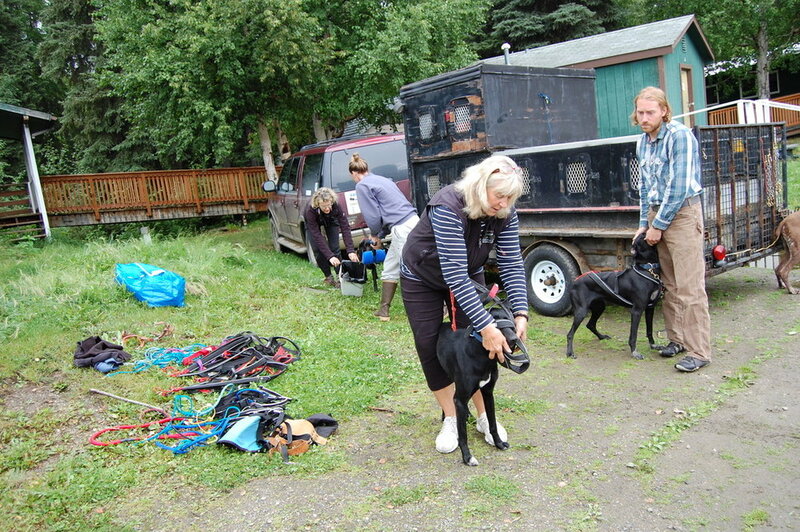 Mentasta Lake School students load dogs into box at Tok Track. Mentasta Lake School student running dogs at Tok Track. Mentasta Lake School students with sleds at Tok Track. Mentasta Lake School student removing dog harness at Tok Track. Mentasta Lake School student handling dog at Tok Track. Eagle School students with puppies at Kia Kennel. Eagle school students ready to run dogs fro Cranberry Kennel. Eagle students learn to harness dog at Cranberry Kennel. Eagle School students running Cranberry Kennel dogs. 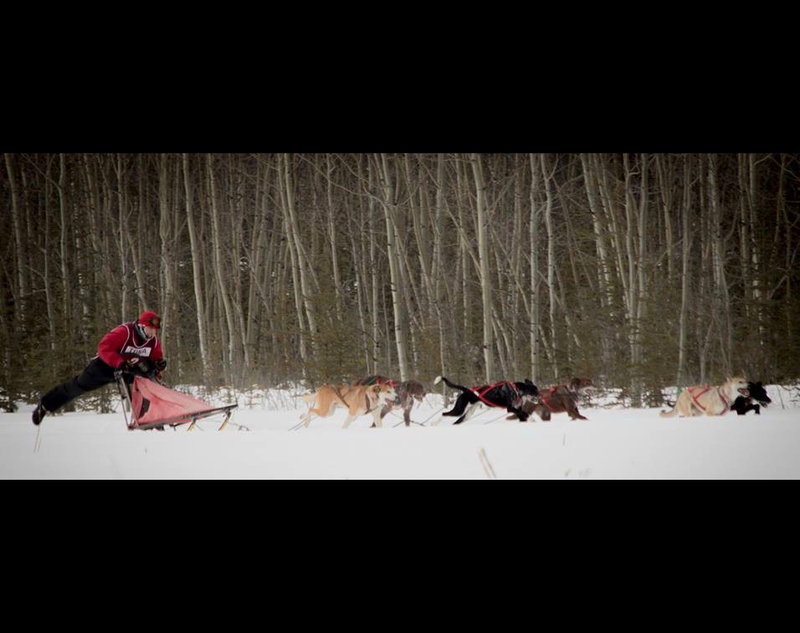 Eagle School students and Cranberry Kennel dogs take a rest during a run. Eagle School students learn about cooking food for dogs. Eagle School students learn how to feed dogs at Kia Kennel. Eagle School students enjoy petting and handling the dogs at Kia Kennel. Eagle School students learn to harness dogs at Kia Kennel. Eagle School students learn about the sled at Cranberry Kennel. Minto School students shadowing a veterinarian while checking in with Iditarod Race musher and dog team. Minto School students with Musher Lloyd Charlie at his kennel. Minto School students at Lloyd Charlie's kennel cutting blocks of meat. Musher Lloyd Charlie teaches Minto School students about the sled. Minto School students sitting in Lloyd Charlie's sled. Minto School students running Lloyd Charlie's dogs. Minto School students ready to mark trail with their snowshoes. Minto School students with Iditarod Musher caring for dogs. Tetlin School students with Musher James Wright and one of his dogs. Tok School 8th graders learn about dogs in classroom. Tok School 6th graders learn about dogs in classroom. Tok School students ready to ride sled with Hugh Neff's dogs. Tok School students running Hugh Neff's dogs. Tok High School students doing hands-on activities with Dr. Jeanne Olson. Tok High School students shadowing Dr. Jeanne Olson. 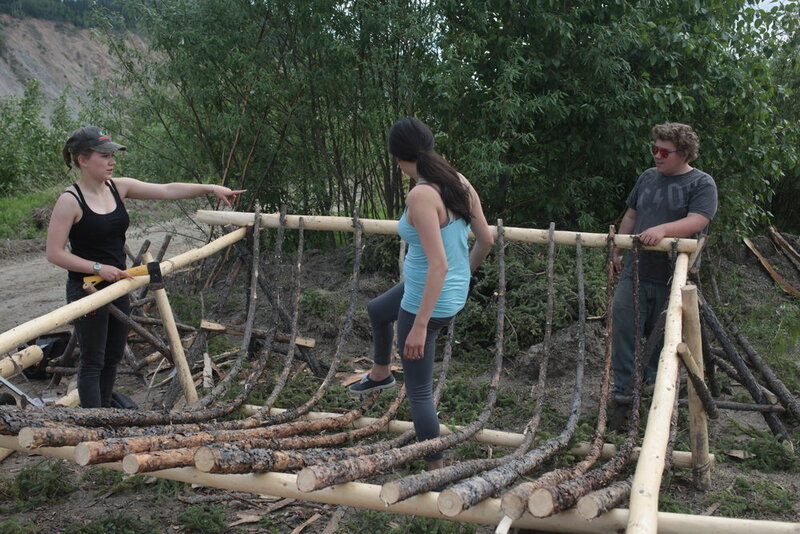 Allakaket School students learn from Musher Steven Bergman how to change sled runner. Merreline A. Kangas School (Ruby) student puts on snowshoes. Merreline A. Kangas School (Ruby) students moving dried fish. Merreline A. Kangas School (Ruby) students learn about handling a dog. Students learn to bead with Amanda Attla. A student shows off his result of the beading instruction. Students buidl dog house in shop with Jessie Holmes and Joe Bifelt. Students build dog house outside with Jessie Holmes and Joe Bifelt. In-kennel classes teaching about dog mushing and animal care were busy this month, along with shop students building fish wheels to help harvest fish for the kennel dogs next season. A-CHILL Musher Teacher Rob Fabian leads a class at the Mentasta Lake Katie John School. Students at Tok school work to build a fish wheel during a shop class. 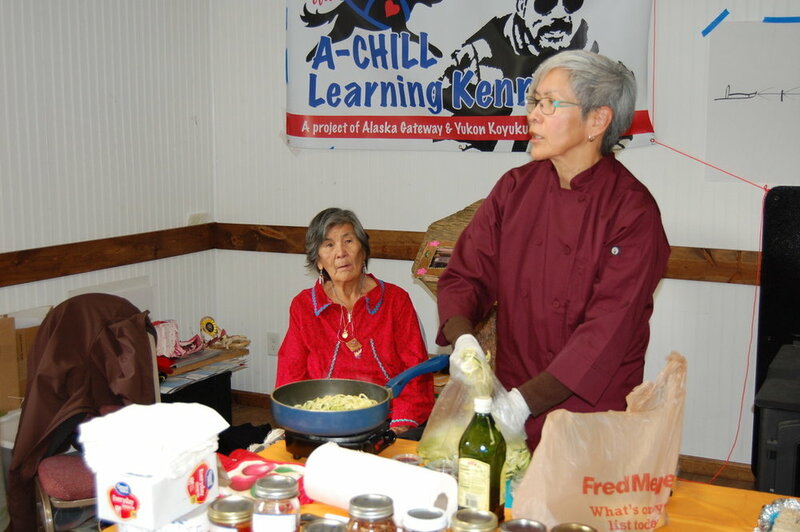 Eagle Community School students learn how to cook food for dogs at local Kia Kennel. Eagle Community School students at the local Cranberry Kennel. Communities enjoyed a great winter this year - lots of races and other activities to celebrate the season and welcome in Spring! 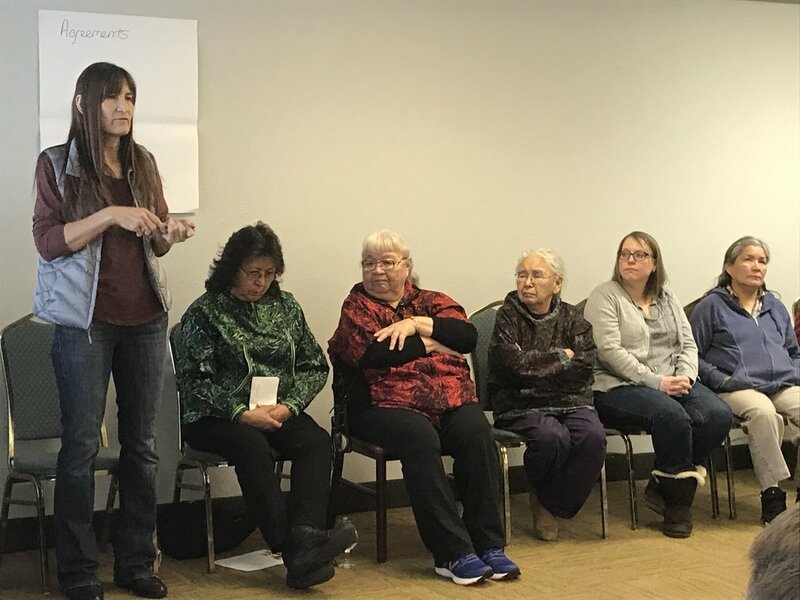 About 15 teachers and 15 community members (many dog mushers/kennel staff) from AGSD and YKSD communities attended this two-day workshop in Fairbanks in March. Together, participants developed a Cultural Calendar (see Educational Resources), talked and worked together a lot about how community residents/dog mushers and school teachers can work together to integrate academic learning with local and culturally responsive contexts. They also explored learning styles and discussed how changing climate conditions may affect (and already be affecting) rural lifestyle and living. Session facilitators included: Malinda Chase, Carol Lee Gho, and Sharon Attla (via Association of Interior Native Educators); Kathy Turco (A-CHILL's Musher Coordinator); Mickey Kenny (of Yukon Koyukuk SD); Nancy Fresco and Katie Spellman (of the Scenarios Network for Alaska + Arctic Planning); Lisa "Kersch" Kerscher and Jennifer Lutey (of Brightways Learning); and, LeAnn Young (of Alaska Gateway SD). Small groups collaborate in developing Cultural Calendar. 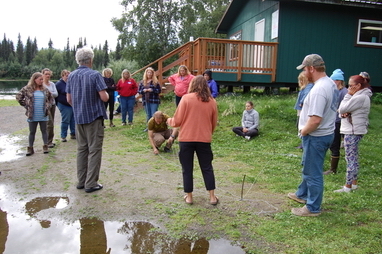 During a field trip to the International Arctic Research Center (IARC) on the University of Alaska Fairbanks campus, our group participated in activity to explore and identify how Rural Alaskan lifestyle and living may be affected - now and in the future - by changing climate conditions. The IARC staff posed some questions to guide discussion activity. Seeing evidence of changing climate where you live? 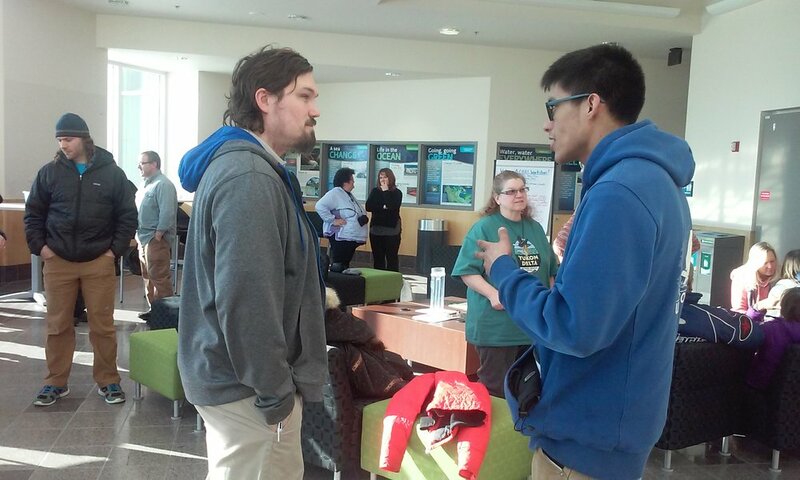 These two participants - from Huslia and Ruby - share their thoughts with each other during this activity. Participants learn about the GLOBE citizen science project in which Alaskan schools/communities can collect snowfall and other data to share to researchers for helping them quantify conditions and trends. This team is measuring and recording total snowfall on the ground at this time. This team is measuring and recording new snowfall on the ground at this time. Measuring and recording data is a team effort and a great one for students, teachers, and other community members! Participants shared some of their observations that may be consequences of changing climate conditions. 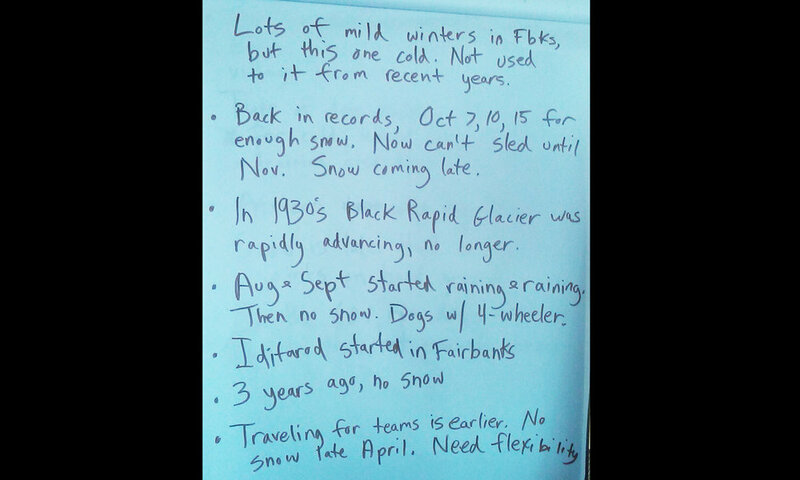 More examples of shared observations that may be consequences of changing climate conditions.